Do you remember that question when you were little? What Do You Wanna Be When You Grow-Up? The choices in the book seem silly to me now, a secretary, a stewardess, or a nurse. Those were the only options for young ladies back then. Every year thousands of kids are asked what they want to be when they grow up. Many don’t know. Even worse, many adults are still struggling to figure out what they want from life. Like many, they fall into the trap of doing what’s expected of them. They end up bored, unsatisfied and make poor decisions based on the life they are living now. They never follow the dreams they had as a kid; instead they wander aimlessly without any goals or direction. 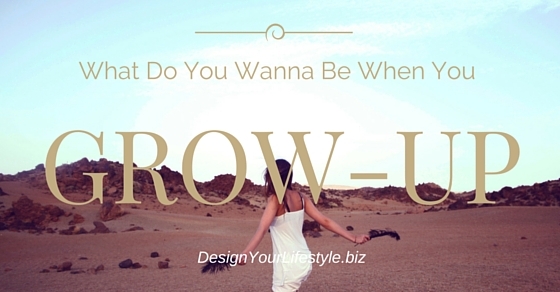 If you don’t know what you want in life, isn’t it time you figured it out? People who know what they want function better in society, know where they are headed, are happier, and make better decisions in life. If you are constantly saying yes to other people for your time and commitments, you can’t figure out what you want to be doing. Put yourself at the top of your list. Ask yourself what you would be doing right now if you had no family, friend or job obligations. Don’t regret things you did or didn’t do in the past, or saying no to others. It’s your life and you should live it the way you want that makes you happy. Constantly regretting things from your past stops you from going forward. Sit down and really think about what you need the most in your life. Is it family and love? The freedom of creative expression? Financial security or serving others? List your priorities. Think about the legacy you want to leave when you exit this world. Figure out what makes you really happy. Is it being around kids or helping the elderly? Maybe it’s traveling or owning a successful business. Determine what the one thing is that makes you the happiest. Then you’ll have a pretty good idea of where you want to be in life. Be specific. If you don’t like your office job, figure out what exactly you hate about it. Is it your workload? Or your freeloading co-worker? Or maybe it’s being inside when you’d really rather be out of doors all day long. Can you fix it? Or make changes somehow? It may take time to truly determine what you want to do. You’re likely to have some detours along the way and make some decisions that will affect how you continue. Keep a positive attitude to help you keep going. Are some of your thoughts limiting beliefs? Things like “I’m not smart enough to do that” or “artists have to starve before hitting it big” are thoughts that limit you taking action and exploring whether this is something you might be interested in doing. Not knowing what you want to do or get out of life can be depressing and scary. We all have a purpose but many don’t know what it is yet. Not knowing where you’re going can lead you to make poor choices along the way as well.